Legal research is an important component of LPO. Individuals interested in building a career in legal process outsourcing (LPO) will first need to familiarize themselves with the processes they'll be handling. 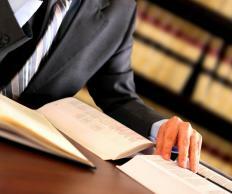 In most cases, this entails taking classes in law and legal research. Gaining experience in the field will help hone these skills, as well as increase an applicant's credibility; as such, people looking to start a career in LPO will benefit from working in a law office. Some responsibilities, such as data filing and audio transcription, don't require prior experience in legal work, but upward movement tends to be more limited in these positions. Adequate experience in the field should prepare individuals for the next step in a career in LPO — starting up their own LPO businesses. A career in LPO can be started in multiple ways, depending on the types of LPO jobs that interest an individual. Each responsibility, from data organization to document drafting and legal research, requires its own specific skill set. As such, applicants should develop the skills needed for a particular position by taking classes and familiarizing themselves with the different systems and tools needed to perform specific LPO services. Many offices offer LPO training to fresh applicants, however, making it a relatively accessible field. Although a variety of LPO jobs don't require any technical expertise in legal matters, it often helps individuals perform their jobs better, as well as opens up more avenues for career advancement. Transcriptionists, for example, will find their jobs much easier when they are familiar with legal terms. People who take a career in LPO very seriously should strongly consider taking law classes to supplement their chosen field of expertise. Firsthand experience with legal processes further enhances an LPO provider's ability to perform, making it very beneficial to work in a law office as a paralegal or attorney. Prior work experience also adds credentials to an individual's resume, making it easier for him to secure a position at an LPO center. Education and experience in legal matters is also beneficial for individuals who want to build a career in LPO by starting their own businesses. Legal degrees and work experience add credibility to an individual's business, increasing his perceived trustworthiness and attracting more potential clients. LPO entrepreneurs should have knowledge of all possible legal processes to be outsourced; working in an LPO center for a number of years can add to this. Sourcing the workers for each field should be a very rigorous procedure, as legal processes are very delicate matters — employers should hire individuals with the best credentials, or at the very least, have several excellent trainers. If needed, entrepreneurs can hire an LPO consultant for additional assistance.